Another character to inhabit the world. The traveling merchant. In this project/game world. You will encounter traveling merchants. 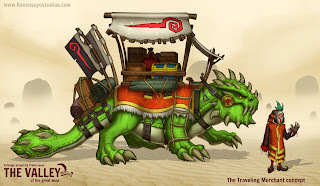 You may find various merchants around the world but the traveling merchants can carry rare goods and assets you may need when in danger on your journey. The order of merchants has a very specific rule set. A merchant must wear a mask of the order. With the symbol of the order on the mask. This is to guarantee customers the highest satisfaction. Some believe this tradition became a rule in these lands. To create a closer business relation between seller and buyer. A salesmen with no mask may be persuasive in the eyes and sell you something you do not desire. It is a rule to be cautious in these lands to do sales with any merchant not wearing a mask of the order. For this is where cursed products come from. Traveling Merchant "Hello friend. How may I assist you today?"